Another successful Goodwill find: a sterling silver unevenly hammered bangle. So I’m wearing it today along with one of my psuedo North African bracelets, some Tiffany’s linked hearts, and the two narrow Native American cuffs. If you are interested, I’m selling some of my jewelry under the vintage section on my shop’s website or a direct link to the Bath Sense online shopping. Thank you At the Library for encouraging me to get my online shop back up and running 🙂 I apologize in advance for so much of my mug modeling the knit goods. Wow. That’s kind of an overwhelming amount of my face. < Previous Do you feel lucky, punk? 😀 Thanks for encouraging me to do that- it prompted me to finally finally change my shop provider, get it properly linked to my site and add items. Sure! That’s fantastic. I love the hats & lots of other stuff especially soaps and of course the bangle collection is gorgeous, I think I recognize one from your blog maybe…definitely stopping by there for holiday shopping. Gold’s not too shabby, though. 🙂 But do you know the trick? Paint the metal with clear nail polish- it creates a barrier between your skin and the metal. I learned this after a nickel earring debacle that left my earlobes all itchy and red. Try it sometime. I think you may have just saved my wallet!!! I tried to wear a lot of the cheaper costume jewelry and my earlobes would become red and itchy too!! I like that one, but I like the top one that looks like ivory better! I don’t know, it looks incredibly rustic and strong. Love the message it carries with the weight! Thanks! 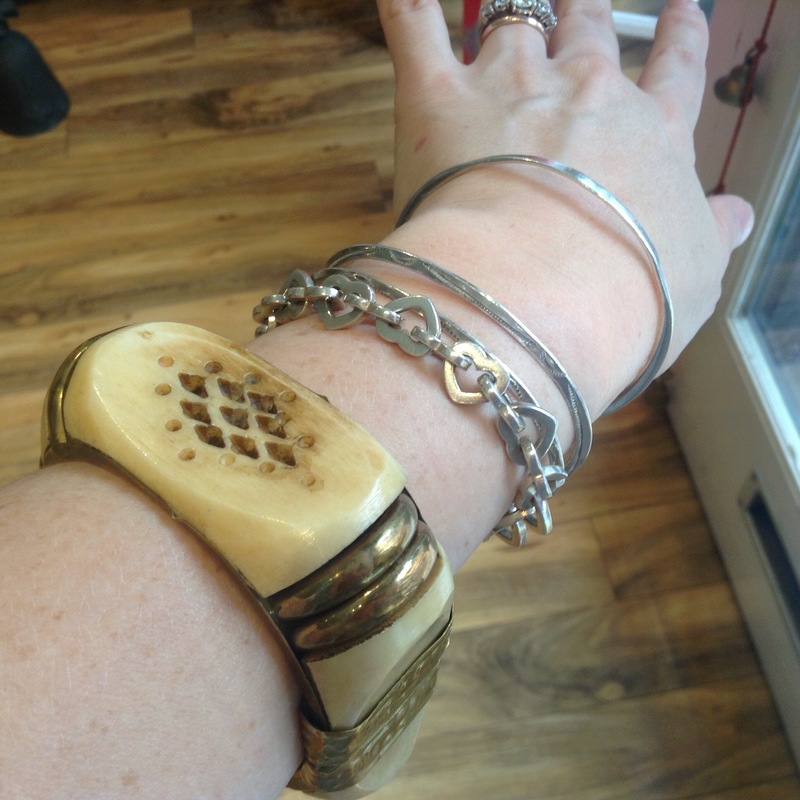 It’s a very cool bracelet, looks like ivory but it’s some kind of plastic I think.